Sharon Wheet of Designs By Sharon, is hosting again at Our Creative Corner this week. Sharon wants to see "Navy, Pink, and Another Color (you decide)". Create a paper craft item and use the challenge colors of navy and pink, and then you pick the missing color...any color...maybe kraft, yellow, gray, etc. Neutrals like black, white, cream, or brown do not count as your extra color. Here is an Inspirational Photo Collage to help you out. 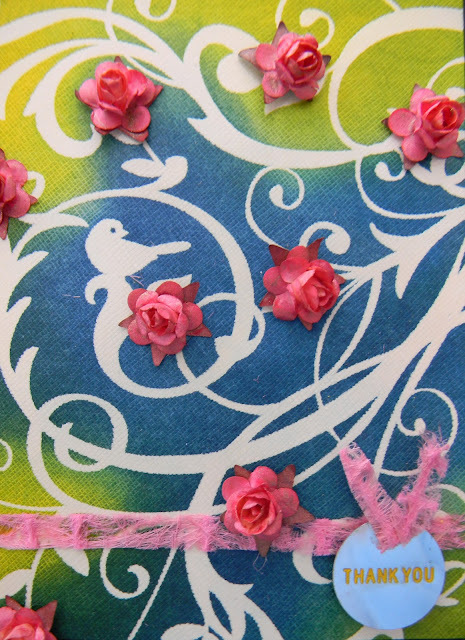 The Design Team has made some very gorgeous projects for you to gain inspiration from. Please check them out. I decided to do a little cleaning out, and discovered some papers I had that I have always wanted to use. 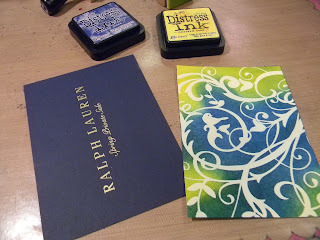 I wish I knew the name of the embossing one. If anyone knows please drop me a message. I thought yellow was a good color to compliment the navy and pink, but I HAVE to say, I do not like this finished card at all. It just did not appeal to me after I added the pink. It's strange that you can create something out of your own mind with your own hands and not like it. 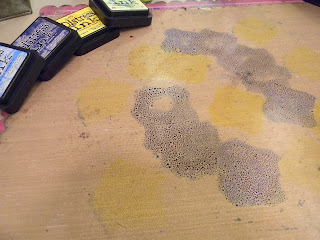 I added 2 yellows and 2 blues to my craft sheet and spritzed with water. I placed my paper in the ink a few times and had some left over, so I added a tag as well. I added some more Distress Ink with an ink blending tool to really heighten the yellows and blues. 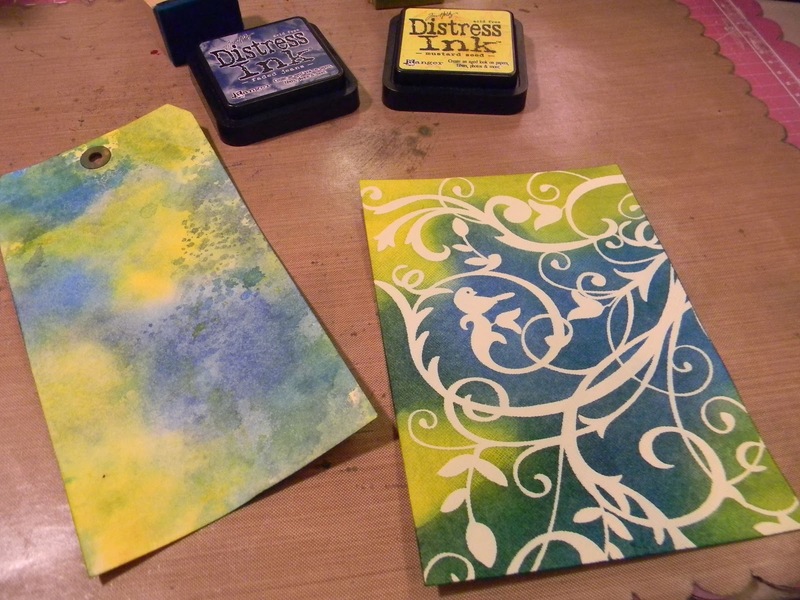 The tag was dipped a few times more than the card so the inks mixed a little to create green. I tried to prevent that from happening on the card. I loved both of these so far. I saved a piece of junk mail because it had a nice weight to it and it happened to be navy. I used it to frame out the card. I still liked everything so far, but that was about to change. 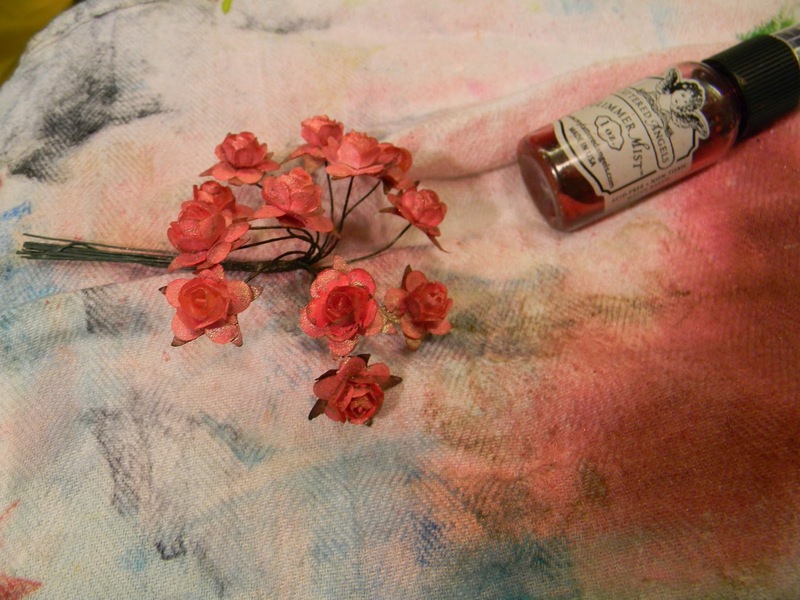 I had some mini Prima Flowers, but they were the wrong color so I gave them a spritz of pink. These came out lovely. I love this homemade paper from Prima as well. The texture is wonderful. So both of the pink items I love...just not with my navy and yellow. I tried to add in more yellow in hopes I would like it, but still no. Очень красиво!Так тепло и по-летнему весело и ярко! Класс! I create things all the time that I don't like, so it's definitely possible. :) I love the background, the blue & yellow is gorgeous, I'm very impressed that you didn't end up with green, as I usually do. I loved the way you recycled the Ralph Lauren paper. There are a lot of things I like about this piece. 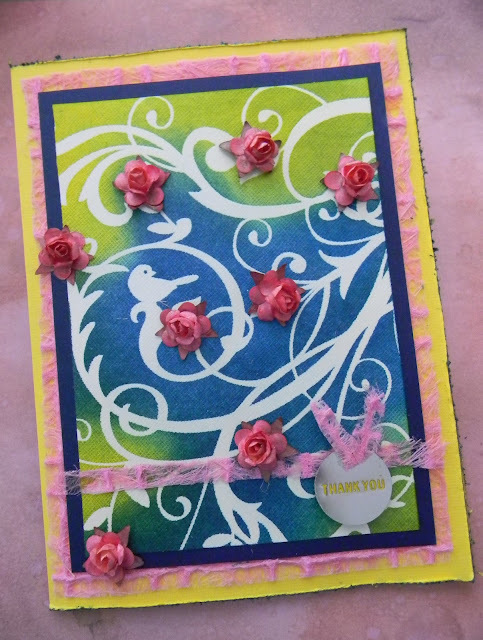 Hi, Anita, this is such a beautiful card. I love the pretty layers and your choice of color combo. It's bright and delightful. The junk mail is a brilliant idea. Lovely. So glad it's not just me that ends up wanting to go back a step! (What a glorious background you've created.) But I think the addition of the pink turns this into something really eye-catching. I'm afraid I have to agree with you! I'm notsomuch a fan of the pink flowers. 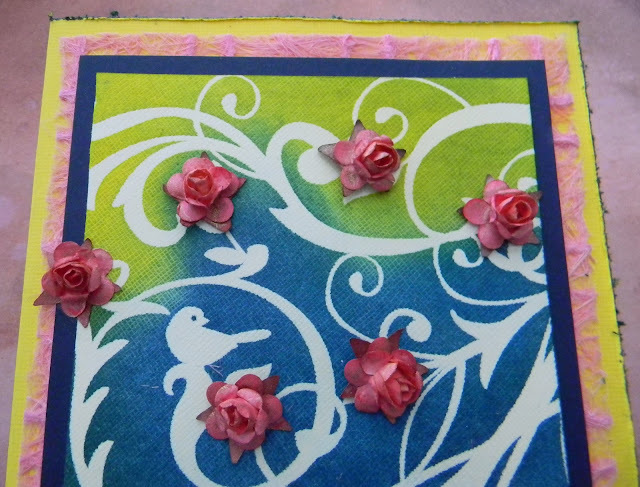 I love the rest of it, but them pink flowers got-ta go!! I'm not much into pink but this all came together pretty well, I think! Hi Anita ! 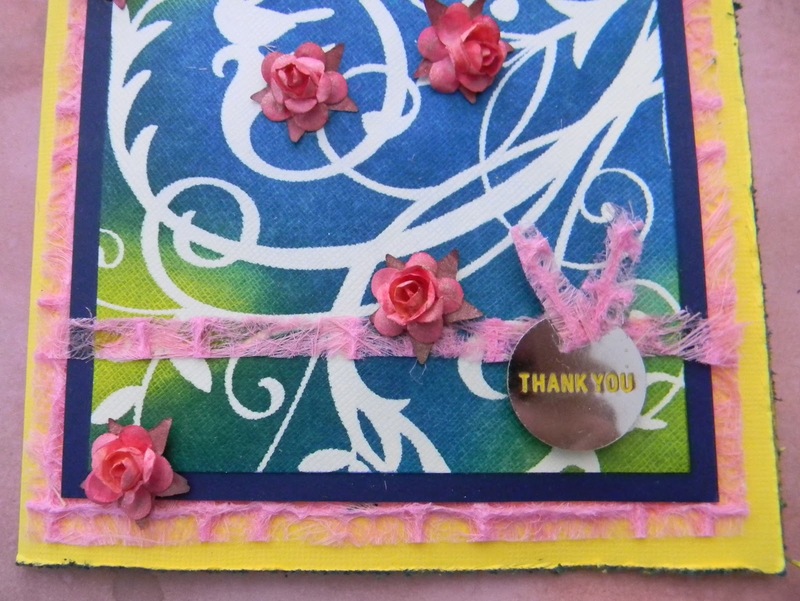 I love yor card , your tutorial and colors you choose! I think that your card came out beautifully, Anita! I love the background you created, and although you don't like the yellow as the third color or the way it looks with the pink I think that both complement very well with the blue, because for me the blue makes the balance between the two other colors. Your focal point is very well defined, and then the eye goes around your card. I think that your mission is accomplished, lol.